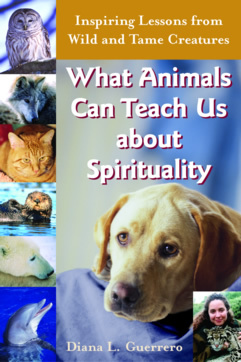 WHATANIMALSCANTEACHUSABOUTSPIRITUALITY.COM ( "Company" or "Site"), including all of its contents ("Material"), such as text, unique images and graphics, and HTML used to generate the pages are protected by patent, trademark and/or copyright under the United States and /or foreign laws. All Material is the property of Diana L. Guerrero, the Company, or its content suppliers, or clients. The compilation (meaning the collection, arrangement and assembly) of all content on this Site is the exclusive property of Diana L. Guerrero and protected by the United States and/or foreign laws. Editorial contents and material are copyrighted by the Diana L. Guerrero and may not be reproduced in any media without prior written consent. All rights are reserved. For reprint inquiries please contact the author. For review copies for media and press outlets please contact Skylight Paths Publishing. Email addresses and names will never be sold. Your privacy is important to us and your information will only be used for monthly newsletter disemination, special announcements, and subsequent book release by Diana L. Guerrero.